Jewish music and jazz get along well together; they have been doing so for years and are perhaps now closer than ever. Jazz musicians use cantorial modes to further their own improvisational explorations, and musicians playing within a klezmer or Sephardic secular tradition include jazz stylings as part of their overall arrangements. Given all this, it is somewhat surprising that few musicians, with David Chevan's Afro-Semitic Experience being the most notable exception, have attempted serious jazz interpretations of Jewish liturgical music. 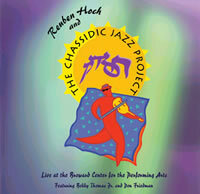 With The Chassidic Jazz Project Live , drummer Reuben Hoch has drawn on both his familiarity with the music and his deep jazz sensibility to add a major work to this genre. In the process, he has highlighted how these traditionally spiritual melodies, when delivered in the right context and with creative arrangements, perfectly lend themselves to uniquely satisfying jazz presentations. Rabbi Akiba's well known "Avinu Malkenu" is transformed into a driving electric blow out courtesy of Tom Lippincott's guitar, Felipe Lamoglia's tenor sax and Dan Feiszli's bass. "Keli Aton" has LaMoglia and Feiszli soulfully interpreting the Lubavitch melody against a complex Hoch and Bobby Thomas Jr. percussive backdrop. The much recorded and interpreted liturgical piece "Adon Olam" is taken through two if its melodies; the beautifully graceful string interpretation features Lippincott teamed with Barbara Corcillo's elegant cello and violinist/violist Marie Randel and then has its traditional melody "jazzed" up and turned Latin. 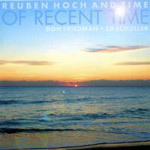 Two tracks, "Shalom Aleichem" and "Shabbat Shalom", allow well-known jazz pianist Don Friedman to show that his skillful interpretive touch also translates well to this project's format. A string-based chamber jazz intro to "Bilvavi" gives way to some metrically intriguing drum showmanship that then finds an up-tempo groove as Lamoglia wails on soprano. Hoch's rap about the great Chassidic songsmith Shlomo Carlebach leads into a furious percussive beat that is picked up by the rest of the band, led by Lamoglia, to present Reb Shlomo's "Crackow Nigun" in a decidedly new light. The Chassidic Jazz Project Live adds yet another wonderful chapter to the ever-evolving relationship between jazz and Jewish music.